AFRICA/DR CONGO - Tshisekedi’s victory. The Bishops: "The results of the presidential election do not correspond to the data collected by our observation mission"
Kinshasa (Agenzia Fides) - The Bishops of the Democratic Republic of Congo "take note of the publication of the provisional results of the presidential election which - they underline - "for the first time in the recent history of our country, opens the way to change at the top of the State". "However, from the analysis of the elements observed by this mission, we find that the results of the presidential election do not correspond to the data collected by our observation mission from the polling and counting stations". 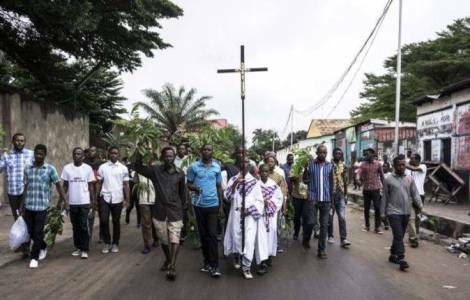 The statement sent to Agenzia Fides and signed by the members of the Permanent Committee of CENCO (Congolese National Episcopal Conference), was issued the day after the publication of the provisional results by CENI that assigned the presidential victory to Félix Tshisekedi. He beat the other opposition candidate, Martin Fayulu Madidi, who came second and Emmanuel Ramazani Shadary (see Fides 10/1/2019). Fayulu claimed to be the winner and to be the victim of electoral fraud. On 3 January CENCO declared that "the data we have obtained, clearly reveal that the Congolese people have chosen a candidate as president of the republic " (see Fides 8/1/2019). The results published are still partial because voting will take place in March in the DRC regions devastated by the Ebola epidemic and by the presence of armed groups that do not allow to vote in safety conditions.